There are no photos with those IDs or post 24565 does not have any attached images! Urban apartments Only 150 meters from San Lorenzo beach and 300 meters from Paseo de Begoña. 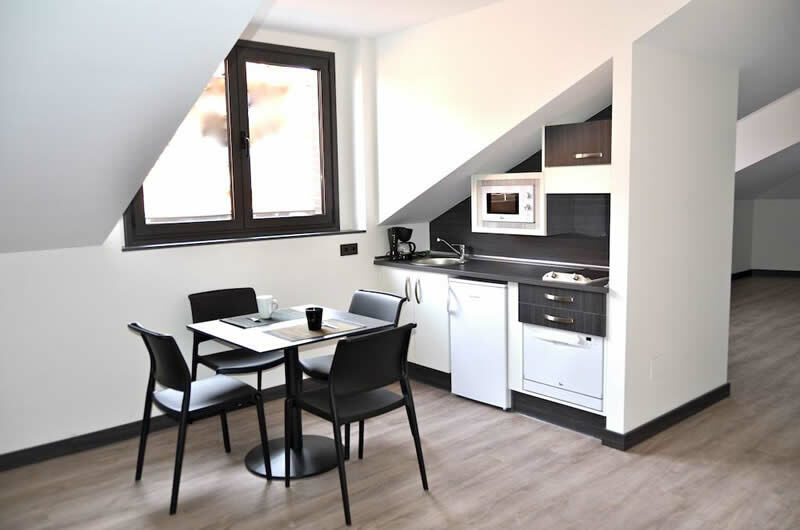 The apartments have a living area with a flat-screen TV, free Wi-Fi, a small dining table and an open-plan kitchen with a microwave and hob. We have 4 studies of 1 / 2 squares between 22 and 28 m2. Equipped with kitchen, bathroom and resting area, they are completely exterior. Ideal for one or two people, they have all the services that will make your stay comfortable. 5 studies of 2-3 people: spacious, bright, functional and fully equipped, between 32 and 38 m2 : living room-kitchen with sofa bed, bathroom and resting area. 7 one bedroom apartments for 2-4 people: between 29 and 42 m2 ; they have living room-kitchen with sofa bed, bathroom and bedroom.